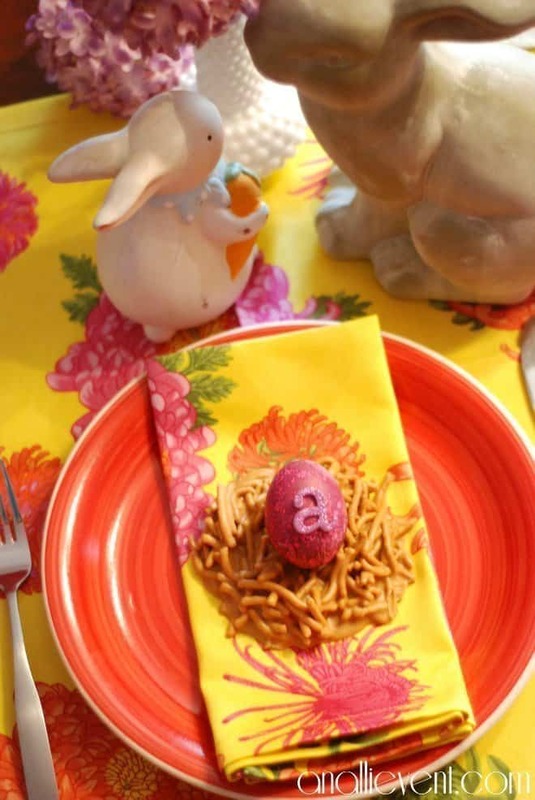 Today I’m sharing a sneak peak of my Easter tablescape along with my hit or miss oven “boiled” eggs. Since the grands will be here, I don’t like to get too fancy. And I like to change it up every year. I’m also including my bird’s nest candy recipe (aka haystacks). Here’s my take on preparing “boiled” eggs in the oven. (The instructions can be found on Pinterest.) While the concept is intriguing, I have a couple of big issues. When I opened the oven door to take the eggs out, one of them popped open and it sounded like a bottle rocket going off, right down to the sizzle at the end. I’m not going to tell you how I almost jumped out of my skin. None of the other eggs were cracked at all, but they did have small brown spots on the shell as if the eggs were sweating and the sweat was dirty. Gross! After I placed those sweat splotched eggs in their cold water bath for 10 minutes, I cracked one open. Lo and behold, those tiny brown spots (that were looking more and more like age spots by now) went all the way through to the inside of the egg. It was almost as if the eggs had tiny moles on them. I just don’t think those brown spots would be very appetizing, but that is just me. I think I will stick to my tried and true way of boiling eggs. Have you ever “boiled” your eggs in the oven? How did they turn out? 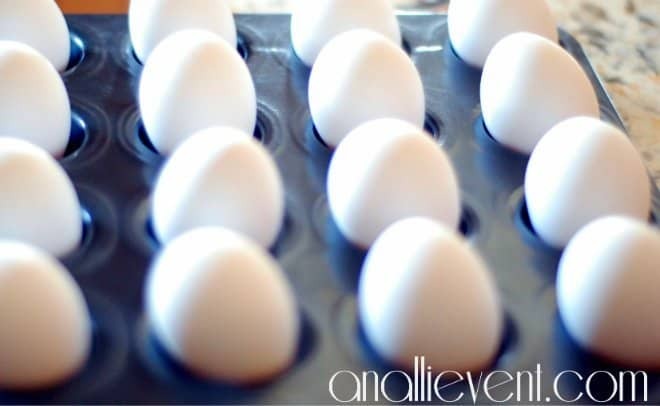 Place eggs (single layer) in a large pot and fill with cold water. Make sure the water is an inch above the eggs. Bring to a boil, cover, remove from heat and set the timer for 18 minutes. When the timer goes off, drain and rinse with cold water until cool enough to peel. Eat or place in the fridge. Done! I had not made the bird’s nest candy in years, but they brought back the fondest memories. When my (now grown) children were young, I was room mom just about every year. One year I was room mom to daughter #3’s kindergarten class and son #1’s first grade class. And I remember making these bird nest candies and filling them with little jelly beans. Oh, what fond memories! Melt the peanut butter and butterscotch chips in a double boiler or in the microwave (heat for one minute and stir. Repeat until smooth). Combine peanut butter mixture with chow mein noodles. Spray hands with cooking spray and shape into nests. Place in the fridge until firm. I love the bird’s nest. I put peanut m&m’s in mine. Yum! Peanut M&M’s would be a wonderful addition! Alli, oh my goodness, your take on the oven “boiled” eggs has me laughing to the point of tears!!! I haven’t tried it, but after your experience, I think we’ll stick to the tried and true method. 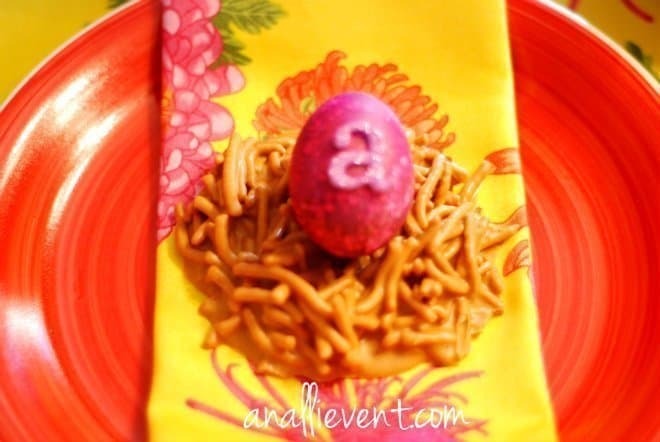 Love these peanut butter egg nests and your table is going to look so pretty! I’m going to be thinking about the moles on the eggs all day! 🙂 Thanks for sharing and the smile! Happy Wednesday! I am loving your Hit or Miss series! I will not try this in my home because you have proven it to be a bad thing. If it isn’t broke, why fix it (tee hee hee), we will just stick with boiling the eggs. I love that candy and your napkins are gorg! I laughed when I read about your baked eggs experience. I’m taking your word and sticking with boiling my eggs which is pretty easy. Love Hit Or Miss!! I have never heard of baking eggs!! I love your display! very pretty! nadeen recently posted…Wine Tasting Series: African American Wine Tasting Society, Inc.
You can find it on Pinterest. And I’m sure it works for some. Maybe it’s just me! :). You always do so well with the tablescapes. The bird’s nest candy sounds great – I’ll have to make it for my kids. I bet your microwave was a mess after that! I don’t like explosions in the kitchen! The bird’s nest candy tastes so good and is so easy to make. So cute! I’m a little disappointed with myself – I booked a wedding to shoot on Easter accidentally. First of all, WHO gets married on Easter?! Second of all, having to sing for three church services and then go photograph a wedding pretty much shoots down any creative idea for the day. I will definitely be checking the calendar from here on out LOL But regardless, THESE are so CUTE! Kristen from The Road to Domestication recently posted…Top Container Store Picks for Spring! Oh, gosh, Kristen! I’m with you – who gets married on Easter? You have one busy day ahead of you! Cute haystacks, will be making! I’ve “boiled” eggs a few times in the oven, the spots pretty much wash off in cold water, they don’t go through to the egg, either. And I never had them explode. When they’re dyed no one could see spots, either. So sorry you had such a rough experience. My spots went all the way through! Maybe my eggs had thin shells! 🙂 I had brown polka dot eggs. I had always heard you could boil eggs in the oven, but I didn’t think it would work out too great. I am so glad you saved me from trying this one. Ps. I love the pink egg!! Amanda Smith recently posted…When to Call 911, and when not to! Thanks, Amanda! I’ll never try boiling eggs in the oven again. And, really, when I think about it, why would you want to heat up your house (in the south) by turning on the oven, when boiling them on the stove is so easy? This is so cute! Pinning. Thanks for sharing, Alli. Thanks, Kimberly! I appreciate the pin! Totally agree with you about the oven boiled eggs. Some of them had brown spots. Like you, stove top seems to be the best method. Sometimes I cook them in my steamer too. Your table scape is beautiful!! Thanks, Michelle! I was beginning to think I was the only one with spotted eggs and maybe I did something wrong. Whew! I LOVE haystacks! And I love your table preview! Your eggs are pretty with the sparkly little letters! Thanks for sharing on Twirl & Take a Bow! DesignedByBH recently posted…#MommyIsCooCoo Over Google+ – Come Grow Your Circles! Thanks for hosting such a wonderful party!